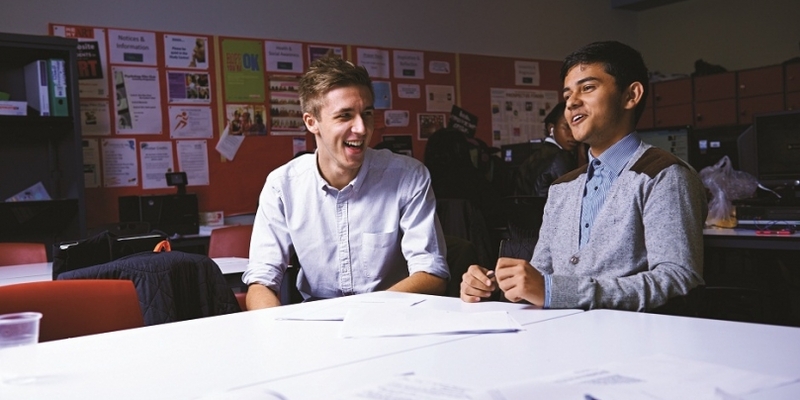 Haggerston Sixth Form is a vibrant community of talented and ambitious young people. Our focus is on academic excellence and developing leaders of the future. We are a small sixth form, able to offer reduced class sizes and high levels of individual support which enables students to make excellent progress and grow into independent, confident adults. We offer a range of subjects which support progression to University or high quality apprenticeships. It is our mission to ensure that our students are able to go on to lead successful, fulfilling lives. Currently, 98% of our students progress onto University, a figure which is well above national average progression rates. We believe this is due to the wide range of support, opportunity and experience students have access to here. Situated in a Grade II listed, historic building, sixth formers at Haggerston benefit from fantastic, state of the art facilities. For example, we have professional-standard drama studios, high quality sports, technology and art spaces. We also have a supervised study support area and common room. Finally, our students benefit from a rich variety of enrichment experiences, from educational and cultural visits to links with our business partners in the City. Our students feel part of a tight-knit community, where they can develop their individual talents and flourish into confident and successful young adults. Mentoring with Freshfields, an international law firm. This offers invaluable opportunities for students to receive mentoring and guidance from a business professional. Starting in Year 12, students gain help with CV writing, presentation skills, interview techniques, coursework and revision through regular meetings. The scheme concludes with UCAS application assistance and preparing for exams at the start of Year 13. Future Leaders – At Haggerston student voice is a very important part of Sixth Form. Future Leaders is a sixth form student leadership programme which involves our young people taking on many responsibilities including: leading assemblies, providing feedback to the sixth form leadership team, and supporting year 11 interviews and parents evenings. Classics Club – Run by members of the Haggerston English department – a celebration of classical civilisation, art, literature and culture. Sports clubs – sport clubs at Haggerston include Basketball, Cricket, Football and Martial Arts. Cookery Club – A dedicated club which aims to develop students’ culinary skills and great preparation for those planning to move away for university to cook for themselves. Film Club – weekly chance to watch films in a new light with discussions and debates. Titles so far have included ‘One flew over the cuckoo’s nest’, ‘A beautiful mind’ and ‘Memento’. Reachout! – a community project which provides opportunities for young people in Hackney to meet and be mentored by leading professionals. A highlight so far this year has been a question and answer sessions with the U.S. Ambassador. With so much on offer we’re confident that every sixth form student will find an enrichment activity to enhance their studies and time here at Haggerston Sixth Form.